Using NHANESIII predicted values, the copd-6 measures and displays FEV1, FEV6, FEV1/FEV6 and percent of predicted. The copd-6 USB links to your PC to produce electronic pdf for attaching to patient’s file and hard copy color reports. Those with measurements within the normal range can be screened out, allowing diagnostic spirometry resources to be focused on those most at risk. The copd-6 usb identifies those at risk of COPD at the pre-symptomatic stage to allow early medical intervention and facilitate better clinical outcomes. This pioneering device screens out those whose FEV1 is normal, and who therefore do not have COPD,without the risk of false COPD negatives. By linking to your PC the copd-6 usb produces electronic & hard copy reports. The average woman in her mid-30s is more than three times as likely to develop the progressive and potentially deadly lung disorder as breast cancer during her lifetime, says respiratory disease specialist Andrea Gershon, MD. She says the average man is more than three times as likely to develop COPD as prostate cancer. Mild COPD: The first stage of COPD is termed “Mild COPD”. Typically, your spirometry test indicates mild airflow restriction. During the first stage of COPD, it is difficult to breath after simple activities.It is much better to begin COPD treatment during the early COPD stages. Especialy when you may not even be aware of decreased lung ability. Since there is no cure for this condition, getting treatment early will ease the discomfort and quite likely hold it’s progression to a slower rate. Its at this stage when people usually seek medical attention. Due to breathing issues, many will cut down on certain day to day activities. As with the mild stage, treatments are available, but no cure. There’s a chance that once at this stage, the disease will continue to progress, leaving one to battle severe COPD. The third stage of COPD is termed “Severe COPD”. Typically, your spirometry test indicates severe air flow restriction. This stage of the disease can be unbearable for some. It is at this stage when one realizes just how afflicting this disease is. Treatment helps to alleviate some symptoms. treatment can ease discomfort and make life more managable. Especially if treatments are applied during the early COPD stages. it is a progressive disease, but as it’s always to one’s advantage to catch it early. The stages of COPD are often defined according to your symptoms plus a measure of how well your lungs work, called your "lung function." The National Heart, Lung and Blood Institute estimates that 12 million adults have COPD and another 12 million adults have COPD and another 12 million are undiagnosed or developing COPD. COPD kills more women that men each year. In 2006, COPD killed more American women than breast cancer and diabetes combined. With an emphasis on preventive care, catching, diagnosing and treating disease states early is critical to improved outcomes. This is especially the case with chronic obstructive pulmonary disease (COPD), a progressive disease that makes it hard to breathe, according to the National Heart, Lung and Blood Institute. COPD can cause coughing that produces large amounts of mucus, wheezing, shortness of breath, chest tightness, and other symptoms. COPD is slow developing, but has very serious health implications. Long-term exposure to lung irritants that damage the lungs, and the airways usually is the cause of COPD. In the United States, the most common irritant that causes COPD is cigarette smoke. Pipe,cigar, and other types of tobacco smoke also can cause COPD, especially if the smoke is inhaled. Breathing in secondhand smoke, air pollution, or chemical fumes or dust from the environment or workplace also can contribute to COPD. 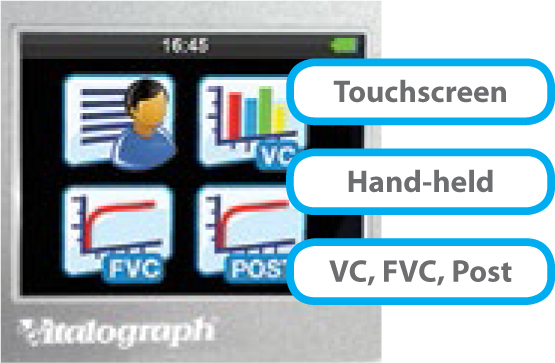 The Vitalograph® micro is a high quality hand-held spirometer at a great value price from the leading provider of spirometry devices to general healthcare and occupational health markets. 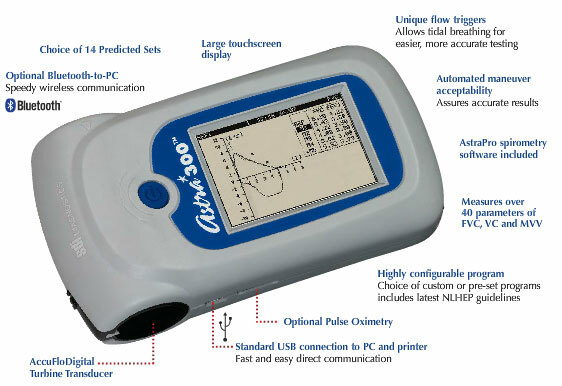 This reliable, easy-to-use, entry-level model offers all required functionalities in a full feature spirometer. The micro is unrivalled in its price range and is the ideal choice for fast, accurate testing in environments where mobility is important. The micro features the same high performance measuring technology used across the Vitalograph range and requires no user calibration. In contrast to turbine spirometers the micro does not feature any sensitive moving parts, guaranteeing robustness and the highest possible measuring accuracy - even at very low or high rates. The Astra300™ puts the sophistication and simplicity of a touch screen in the palm of your hand. Enter data, test patients, and send and print reports with precision and ease. Easily report your choice of up to 40 spirometry test parameters, all measured accurately and precisely. Astra300™ Puts Sophisticated Simplicity in the Palm of Your Hand. The Touchscreen Makes It Easy. SDI Makes It Accurate. Easily report your choice of up to 40 spirometry test parameters, all measured accurately and precisely with the highly sophisticated Astra300 Spirometer. Using the bright and sensitive touchscreen, you can easily access multifunctional capabilities and view both graphic and tabular data. Entering patient data, patient testing and reporting couldn't be easier. Exporting test data to a printer or PC via USB is quickly accomplished with just a few stylus taps on the touchscreen. 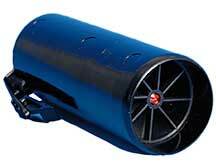 A Bluetooth-to-PC module is available as as option for truly wireless communication. Test patients in your office or lab, with a wide array of testing configurations. Observe test results in real time. Download test results to the patient's permanent record. Perform interactive real-time testing on your PC. Save results to permanent records or print hard copies of selected data. Starter pack of 10 AstraGuard™ PFT filters, designed expressly for the Astra series, included with every purchase.